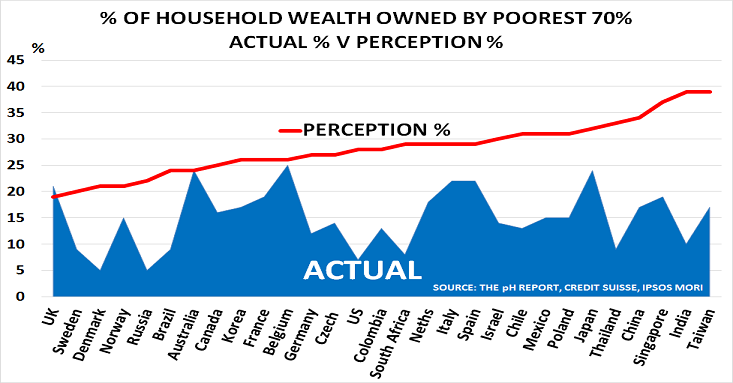 “Some countries are incredibly inaccurate: Indians think this group owns 39% of the country’s wealth when actually only 10% do. The US is also significantly out: Americans think the bottom 70% own 28% of the country’s wealth, when it’s actually a quarter of that at 7%. The past few years of high profile stimulus policies has only added to the confusion. Most visitors were immediately impressed to find an expensive new airport when they landed. They were similarly upbeat to find shopping malls filled with western luxury goods. Naturally, they assumed this meant the economy was booming. And, of course, the major international banks were happy to supply them with imaginative and glossy reports on the country’s potential, in the hope of winning lucrative project work. The end result, unfortunately, is that many companies have effectively been wearing rose-tinted spectacles when making investment decisions. They now face a very difficult time as these plants all start to come online.  They were at least able to cancel. If it had already been built, it would probably now become a “white elephant”. Unfortunately, this creates a further problem for “consensus wisdom”. Much of what appeared to be true during the SuperCycle is no longer correct. As I noted on Monday, economic criteria are no longer the key to future profitability. The next 12 months are therefore likely to see more change than we have seen in the past 20 years. Companies and investors that fail to quickly realign their perceptions with reality will risk finding life very difficult indeed. Many commentators were shocked by China’s weak trade data on Monday – with imports falling 12.5% versus July 2015, and January – July imports down 10.5%. But they were no surprise to anyone focused on developments in the chemical industry, which has once again confirmed its status as the most reliable leading indicator for the economy. The data also confirms that China is now well on the way to reaching its ambitious targets for self-sufficiency (as set out in the current 5-Year Plan to 2020). For ethylene (the raw material for PVC, alongside chlorine) the aim is to reach 62% by 2020, compared to 49% in 2014. Unfortunately, however, many commentators still remain in denial about these developments. Their shocked reactions to the trade data confirm their continuing failure to appreciate that China’s economic policies have never been based on Western concepts of cost-curves and corporate profitability. 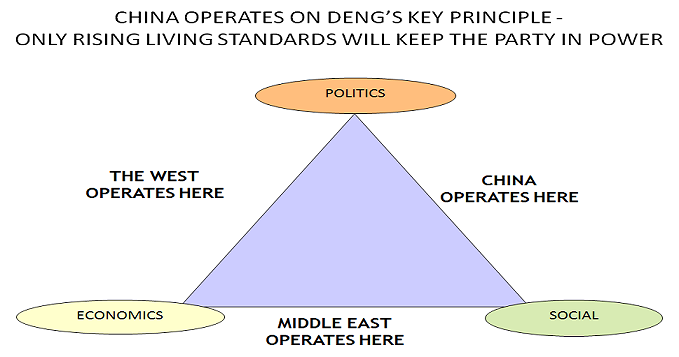 As the chart above suggests, China is instead focused on avoiding social unrest, and preserving the Communist Party’s hold on power. It follows Deng Xiaoping’s policy, which aimed to keep living standards rising in order to maintain the Party’s role in government. The other key change in recent years has been President Xi’s decision to move away from the stimulus policies followed between 2009 – 2013, in response to the financial crisis. China had provided around half of the total stimulus during this period. Inevitably, therefore, this triggered the Great Unwinding of global stimulus. Unfortunately, as shown by this week’s reaction to China’s trade data, consensus thinking still fails to recognise the impact of these New Normal developments. But this failure also creates a major opportunity for those individuals, companies and investors who prefer to trust their own judgement on the outlook for China and the global economy . Polymer traders must be already counting their end-of-year bonuses, as the value of the US$ rises whilst crude oil prices weaken. The biggest bonuses will likely go to polyethylene (PE) traders competing with US producers. The reason is that US ethylene spot prices are currently at record levels. An astonishing 10% of US ethylene capacity has been out of action since March due to outages. And as ICIS’ John Dietrich notes, 14% of capacity will be down in October due to further planned turnarounds. European end-user demand remains weak, so this tightness will likely be only temporary. European cracker producers are no doubt already ramping up output as fast as possible, to take advantage of this unexpected windfall. They are ideally placed to boost exports, with the euro down 8% since May. Today’s lower oil prices will further boost their export competitiveness. 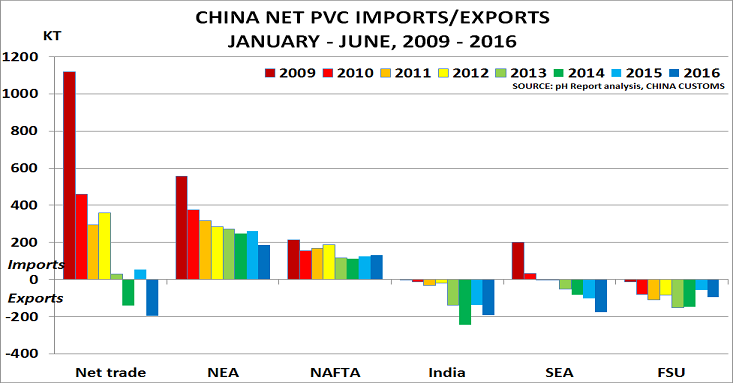 “A slew of lower-priced domestic cargoes offered to the spot market weakened the appetite for imported PE resins. Most traders and downstream manufacturers stood on the sidelines as they were bearish about the outlook. Meanwhile, a Middle East producer slashed its price offers significantly, which negatively affected market confidence in the week. In line with this, traders are expected to cut their price offers to the spot market”. Market conditions like this are a gift to traders. And Q4 is likely to be the gift that goes on giving, as favourable exchange and feedstock movements look likely to continue. Senior executives need to urgently review their expansion plans before it is too late, and refocus instead on the transition taking place to the Boomer-led New Normal. Their current problems confirm that access to low-cost supply is no longer sufficient to guarantee future profitability. Instead, securing demand outlets in a low growth world must take priority, if they want to create sustainable profitability.